division and Mail Guard jobs vacancies in Railway Mail Service Division of Rajasthan. There are total 126 vacancies available in this Rajasthan postal circle and RMS. Candidates can apply online for this postman and mail guard jobs vacancies through Rajasthan Postal Circle official website @www.doprajrecruitment.in from 27-10-2017 to 27-11-2017. The selection for this Raj Postal Circle Postman Jobs Recruitment 2017 will be conducted through written exam only. For more information related to Rajasthan Postal Department Postman Jobs educational qualifications, age limits, how to apply online, exam syllabus and pattern are given below. Download official notification here for Rajasthan POSTAL CIRCLE Postman Recruitment. Exam date will be announced later. There are total 126 vacancies available in Rajasthan Postal Circle. Candidate should have qualified SSC (10th) or matriculation or its equivalent from recognized boards. As on 20-October-2016 General candidates age limits are 18-27 years. For Scheduled Tribe /Schedule Caste 5 years, For the OBC candidates of Rajasthan 3 years, For PH candidates 10 years and PH SC/ST candidates 15 years of age relaxations are given. 1. Application fee is Rs.100/- applicable for all the candidates. (Total Rs.500/- for general and OBC candidates and for SC/ST Rs.100/-). Candidates have to pay fee in any one of the E Post office only. The selection for this Rajasthan Post Offices Recruitment to be done through an objective type Written Exam only. Written test will be conducted for 100 marks with objective type multiple choice questions and 2 hours duration. Topics : 10thstandard level Reasoning & analytical ability, Constitution of India, Geography, Indian History, General Politics, Olympics, General Science, Economics, Freedom Struggle & Sports and Current Affairs. Topics:- Decimals & fractions, Number systems, Relationship between numbers, Fundamental arithmetical operations, percentage, Simple interest, Time & work, Time & Distance, Average, Discount, Partnership, Use of Tables & Graphs, Ratio & Proportion, computation of whole numbers, Profit & loss, Mensuration. Topic:- Shabd Pad, Kriya Bhed, Mishr & Samyukta Vakya, Swar Sandhi, Alankar, Vyakyom ka Rupantaran, Samas, Muhavare & Lokoktiyan, Apathit Gadyansh, Ashudh Vakya Shodhan, etc will be asked on 10th standard. Apply online only through the official website of www.doprajrecruitment.in Provide all necessary information and upload the image and submit the application form. Generate fee payment chalan and pay the fee in any one of the E Post offices. Click here to apply online for the recruitment of Rajasthan Postal Department Postman and Mail Guard Jobs Recruitment 2017. 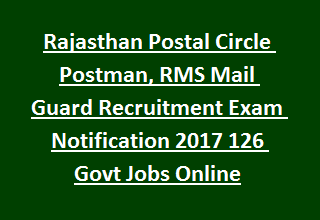 Please share this RAJASTHAN POSTAL CIRCLE Postman and RMS Mail Guard Recruitment 2016 article to your lovable friends through online social networking sites.